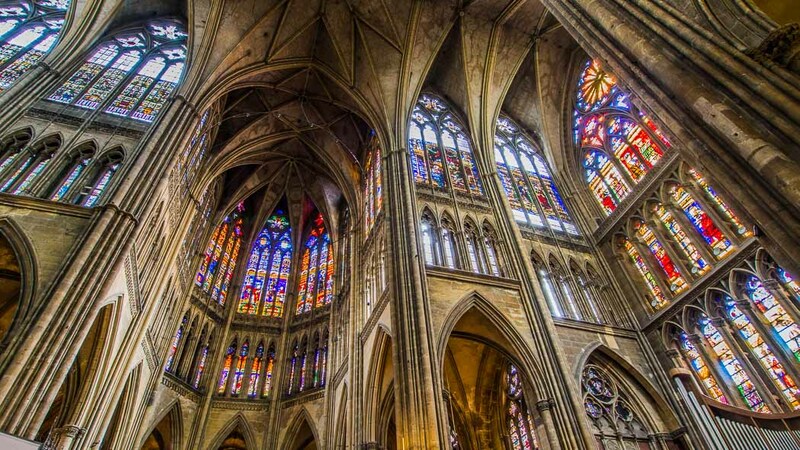 Sir Bannister Fletcher didn’t even mention the cathedral Saint-Étienne de Metz in his seminal text “The History of Architecture on the Comparative Method” perhaps the ultimate textbook of its kind for more than a century. It’s a curious omission one would have thought if for no other reason that the forty something metres height of its nave, and remarkable six and half thousand square metres (yes that’s more than half a hectare) of stained glass, but then the one questioning Sir Bannister’s decision still has nightmares about his final year architectural history exams sat almost half a century ago and may therefore not be in a position to criticise. Perhaps it was because of this omission, (or perhaps because of the nightmares!) we studiously ignored the place during our first few dozen visits to the city, but we can ignore it no more. Now each time we pass we poke around inside, to discover a little more, taking time to read the carved graffiti in the darkest of its corners, (surely in the eighteenth century that would have been a capital offence? ), smug as we watch the people discovering it for the first time, wondering what they are going to do with their hundreds of photographs, without for a second wondering what we are going to do with the thousands we already have. Yet the quest continues to find a souvenir more satisfying than the last. It’s not just the enormity of the thing, or the sheer impossibility of its structure, it’s trying to come to terms with it having been here for a thousand years, that all those years ago someone could conceive it and build it and preserve and protect it, to say nothing of the price that must have been paid over that thousand years in terms of currency and the community. For all of that we can still walk around inside and marvel at it and scribble our names on the columns in black indelible ink…. apparently. So often we think of people in previous centuries as primitive, and then we have to ponder the erection of magnificent structures like these, without modern tools or modern engineering tools. Wow! I love the phrase "cathedral thinking." Those who conceived and initiated the cathedrals did so, knowing that they would not live long enough to see the construction finished. In our world, businesses are run quarter by quarter. Who thinks long term? Amazing height and architectural genius in these beautiful vaulted ceilings! Achieved with engineering plans that required mathematical and technical genius way beyond their day with the primitive tools they had on hand or invented!